Are you looking for a product that has multiple applications for your MS-LS1-4 or 4-LS1-1 unit on invertebrates and vertebrates? 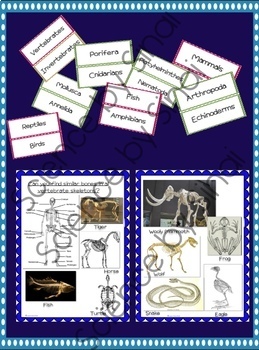 The components of this unit allow you to design many different activities involving classification and characteristics of the Animal Kingdom. - 40 full color slides/task cards that are created with a 8.5” by 11” format with an image and a space for a text box. 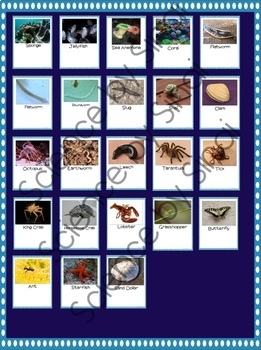 -vertebrate and invertebrate headings that can be used for sorting activities or enlarged for a bulletin board. 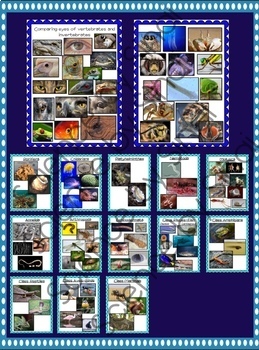 -A slide for each one of the above groups with images of representative species from each one. 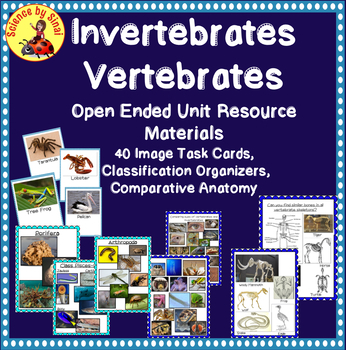 -Two slides with the title “Can you find similar bones in vertebrate skeletons?” that includes a labeled human skeleton and examples of many vertebrate skeletons for comparison discussions. -Two slides with the title “Comparing the Eyes of vertebrates and invertebrates“ with many close-up images of eyes for comparison discussions. This was created in a PowerPoint format so that you can either print out the components or send the slides digitally to their devices via Google slides. Please check out my digital interactive classification activity.